The theme for tonight's World of Wine tasting was balance, so of course we had to have some wines which are out of wack somehow or other. An easy call is a young wine from tannic grapes, especially one which is super-extracted: the kind of bottle which still needs a few months or a couple of years to let the tannins calm down. 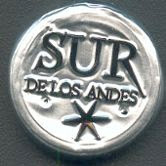 The Sur de los Andes Winemaker's Selection Malbec ('05, cork) is just the thing, with the added advantage of having loads of interesting flavours to it. When I opened it I wondered if it was faulty, since it seemed to smell of fish food, but then two of my fellow tasters found similar aromas (seaweed, fish). My note also says, "inky", and "octopus", but then it also says "spice", "gingerbread", and "Yeehaw!". It scores 4+, excellent. If I have the willpower, I expect it might turn into a five-pointer by 02009.